You sure Urobuchi isn't writing this? Not bad enough that we had girls turning into witches, now we have a girl that turned into a witch... twice. Plus, Saints at the cross. The symbolism is off the chart. Puella Magi Kazumi Magica: The Innocent Malice is a Spin-Off Manga of Puella Magi Madoka Magica, written by Masaki Hiramatsu and illustrated by Takashi Tensugi. It runs in the monthly magazine Manga Time Kirara Forward and features a different set of characters in a new plot separate from the anime, which it may or may not have a relation to. Kazumi Magica follows Kazumi, a young girl who wakes up in a suitcase with amnesia. Fortunately for her, she's quickly reunited with her friends, Umika and Kaoru. But when her life is in serious danger from a giant praying mantis, she unlocks her magical potential and transforms into a Magical Girl. Kazumi doesn't remember anything about who she was before she was locked in that suitcase, but as she works towards finding out more about her past self and her strange and difficult quest to fight Witches, what will the "new Kazumi" become? Late Arrival Spoiler Warning: Puella Magi Kazumi Magica uses major plot points from Puella Magi Madoka Magica. As such, this page will have marked and unmarked spoilers for Madoka Magica that may or may not ruin your enjoyment of it if you have not seen the series already. This is in addition to the spoilers this page will have for Kazumi Magica itself. Avoiding this page is highly recommended for those who have not seen the show. YOU HAVE BEEN WARNED. Amazon Brigade: The Pleiades Saints, a seven-member team of magical girls. All There in the Manual: The collected editions have some information that isn't in the serialized chapters, such as the name of Kazumi's cat (Toto), and Airi's last name. Kazumi's cat was later named in-story in Chapter 12. Alternate Character Reading: In chapter 3, a grief seed is called a "witch's essence/seed" (魔女の実, majo no mi). Which is a Call Back to Episode 8's Wham! Line. In Chapter 8 Jubey initially refers to Kazumi's magic as "breaking religious law"/"sacrilege" before apparently correcting himself and saying it's "destruction". Both are "hakai" in Japanese. Mirai Wakaba's name, which means "Future Young Leaf", is similar to the name of her museum, "Ashitaba (Tomorrow's Leaf) Bears". Animal-Eared Headband: Satomi has cat ears on her magical girl costume. Kazumi also has these on a hoodie on the cover of chapter 3. And Then John Was a Zombie: It's revealed that Kazumi is actually a clone of a dead Puella Magi constructed from the flesh of witches. Also applies to the girls who turn into witches, which so far includes Nico's "spare" and Satomi. Arc Welding: Kyubey and Mami's presence in this series connects it to the anime. Art Evolution: Starting in chapter 3, the Soul Gems look the way they do in the anime. Before that, they just looked like unadorned stones. Another example is with the Evil Nuts. The first compilation volume redrew the Soul Gems and Evil Nuts from earlier chapters so that they remained consistent. Art Shift: In one panel during chapter 10 while the Pleiades are affected by a witch's kiss, the art becomes simplistic and much more cartoony with the characters all white and the background all in black with no shading. This is a reference to the anime's Deranged Animation. Author Appeal / Creator Thumbprint: Every chapter is named for food, all of the magical girls are Big Eaters, and three of them are also good cooks. It's a wonder Charlotte hasn't appeared. Kazumi takes the Calling Your Attacks in Gratuitous Italian seen briefly in Madoka Magica and runs with it by having every magical girl in the series name their attacks and spells in Italian. The author of Kazumi would later write the screenplays of two of the Madoka Magica audio dramas, one of which has a new called attack in Italian that wasn't present in the original series. Word of God says he added another Italian-named attack in the screenplay of the other Drama CD, but it was cut from the final product. Author Catchphrase: "Ciao!" It appears in the Q&A pages for the collected editions (as "Ciao, Hiramacchi!") before finally popping up in Chapter 10. Awful Truth: You knew it was going to happen. After Chapter 5, Kazumi has learned firsthand that magical girls become witches. What's worse is that Kazumi's teammates knew it already and were keeping it from her. In Chapter 9 we learn the other Awful Truth: Kazumi's teammates are actually taking the Soul Gems of magical girls and turning their bodies into Human Popsicles. Chapter 13 reveals that the real Kazumi became a witch and died; the Kazumi we've been following is the latest in a series of clones. Be Careful What You Wish For: Averted with Kazumi's friends, who used their wishes to support their dreams without having them granted outright. As of Chapter 5, it's played straight with Yuuri's wish, which was....to become Yuuri. See, she's not the real Yuuri, but rather her friend Airi. The real Yuuri wished to heal Airi from her life-threatening illness. Both their wishes ended badly; Yuuri used too much of her magic to heal people, while Airi was already not in the right frame of mind when she made her wish. It should be elaborated; in the anime, it's explained that "imbalanced" wishes have a type of Equivalent Exchange penalty. The greater a wish, the more likely for it to go awry or demand a cost that you can't afford. Someone apparently explained this to most of the cast beforehand, so they were careful to make their wishes aids to achieving their dreams as opposed for directly wishing for their dreams to be fulfilled. This also gives the benefit of the girls being able to take full responsibility for what happens afterwards, rather than taking in grief due to cruel fate. Their attitude is taken from Michiru, who didn't wish for her grandmother to be cured, but to spend whatever time her grandmother has left together. She said she wanted to respect her grandmother's lifestyle. In this way, she avoided making the same mistake Kyoko made, which was to wish for followers for her dad without considering how he'd feel about it. Beyond the Impossible: It's possible to have two Soul Gems in the same body. Elfen Lied parallels are noted. Big Bad: Yuuri, the mysterious magical girl. She's ultimately Hijacked By Kyubey in Chapter 5. Bilingual Bonus: The "Palla di Cannone" and "Limiti Esterni" attack names are Italian for "Cannonball" and "Outer Limit", respectively. More appear in Chapter 3, although some of the words aren't Italian. The author seems to like Calling Your Attacks in Gratuitous Italian - see Author Appeal, above. His catchphrase ("Ciao") is also in Italian, and is said by Kazumi in chapter 10. The Blank: What Nico does to the body of her "spare". "...the story of 'Kazumi' is a hearty comedy with girls having fun!!" "There won't be stuff like blood no matter what (This is Manga Time Kirara Forward, you know)"
Bloodier and Gorier: Chapters 4 and the following chapters aren't just more violent than the preceding chapters, they're also more violent than the parent series. Body Horror: Occurs in Chapter 6 to Kazumi and Yuuri's witch form. In a nice bit of symmetry, Kazumi's Body Horror is caused by Yuuri's magic trying to turn her into a pseudo-witch, while the witch's Body Horror is caused by Kazumi's magic trying to turn her into a pseudo-magical girl. And then it's revealed that Kazumi already IS a pseudo-magical girl, and the Evil Nut was turning her back into a witch. According to Satomi, the Kazusa clones were created by stuffing empty bodies with bits of witch flesh. Bottomless Magazines: Averted with Kazumi's summoned guns. They do run out of ammo, and fairly quickly. Brainwashed and Crazy: The effects of Evil Nuts on ordinary humans. Breather Episode: Chapter 8 is a return to the comedic elements of the first three chapters. This trope is then subverted at the very end. Bridal Carry: Nico does this for Kazumi two times in chapter 8. Broad Strokes: It seemed this way at first, but was arguably subverted. Broken Bird: To an extent, all of the Pleaides except Kazumi. Knowing that the witches you're killing used to be humans will do that to you. And that you're ultimately doomed to become one of them. Bullet Hell: Chapter 7 page 19 gives us this. The Cameo: Silhouettes of Madoka and Kyubey are seen when Umika and Kaoru start explaining about magic. Kyubey himself appears briefly in Chapter 4. He has more of a role in Chapter 5. Madoka makes another appearance in her Magical Girl form in one of the extra short comics in volume 1. Sayaka and Oktavia von Seckendorff appear as examples for an explanation the Pleiades give Kazumi in chapter 10. The biggest is in Chapter 11 when Mami Tomoe appears - it turns out she saved Kazumi from a witch before Kazumi contracted. In Chapter 16, Kyoko makes an appearance in a flashback, where she battles with Yuuri Asuka before Michiru arrives and breaks it up. Call Back: "Your wish has surpassed entropy". May be a Call Forward depending on Kazumi's place in the timeline. Many of Kyubey's appearances in Chapter 5 are visual references to the anime, such as watching Airi's witch transformation, or being framed in shadow behind a hospital window curtain. Compare Yuuri and Airi's initial appearance at the hospital in Chapter 5 with similar scenes between Sayaka and Kyosuke in the anime. Jubey's first lines in Chapter 11 are pulled almost directly from episode 10. For an actual in-story Call Back, Kazumi's brief flashback in Chapter 1 where she remembers that only bad guys waste food appears again in Chapter 11. Chapter 12 has Jubey recite Kyubey's monologue about witches from the end of Episode 9. There's also two more call backs to the flashbacks Kazumi has with her earring-bell from Chapter 1. Calling Your Attacks: Unlike the anime, where only Mami did this, Kazumi Magica takes this trope and runs with it, complete with Gratuitous Italian. It's later revealed that Mami was actually the first magical girl Kazumi met. Kazumi is purposely trying to imitate Mami, and insisted the Pleiades play along. The Cavalry: The Pleiades Saints in Chapters 3 and 8. Cerebus Rollercoaster: ...Chapter 8 brings back the comedic elements from the first three chapters. Followed by more horrible things happening. Cerebus Retcon: The Pleiades' wishes could be considered this (Umika's wish for an editor to recognize her works, Kaoru wanting a healthy body to play soccer, Satomi wanting to talk to animals and Nico wishing for "regeneration"). When we first hear them they seem pretty innocuous and simplistic, compared to other wishes made in the series. They take on a serious meaning after ch 10. when you learn their backstories and find out why they would make these wishes. Kazumi's bells. They turn out to be a keepsake from her grandmother. Yuuri has several. All of her "clues" in Chapter 4 are explained in Chapter 5. Another one is disguising herself as Satomi in Chapter 3, hinting at her wish. However, the one that's easiest to miss is the spoon hanging around Yuuri's neck. Extremely subtle. At the beginning of Chapter 9, notice that the top of Nico's Soul Gem has a hexagon. Now later on take a look at the Grief Seed Nico's witch form drops - it has a diamond instead of a hexagon. Grief Seeds don't change like that. It turns out that was Nico's "spare". The news article Nico is looking at in Chapter 7, which was about a Japanese kid who shot people in California. In Chapter 8, copy-Nico's witch form has shooting target dummies as familiars, and in Chapter 9 there is a colored picture of Nico holding a gun. It's revealed in Chapter 10 that Nico was the kid in the article and the whole thing was a horrible accident. Nico's wish for regeneration gives her the ability to create clones. Including the current Kazumi. Continuity Nod: Chapter 5 has a flashback that shows Souichirou Tachibana's old restaurant. The container used to hold the Evil Nuts in Chapter 4 reappears in Chapter 10. It's purpose was to hold magical girls and their Soul Gems. The Corruption: Like in the anime, Soul Gems still get dirty when magic is used. Unlike in the anime, the Weasel Mascot is quite capable of purifying them. In Chapter 4 we learn that psuedo-witches are ordinary humans that have been implanted with an Evil Nut, an imitation Grief Seed created by a magical girl. This gives them the ability to transform into monsters, but it also makes them kind of nuts. In Chapter 5 Kazumi is implanted with an Evil Nut. Her body starts taking on monstrous qualities, but she seems to be able to reverse the transformation somehow. Covers Always Lie: Kazumi spends two chapters with long hair, after which it is cropped short by Umika and Kaoru. The manga is billed as a heartfelt alternative to it's former. It does look that way for the first few chapters, but then moves into a much darker tone. Crucified Hero Shot: All the Pleiades in Chapter 5. Cryptic Conversation: "It doesn't matter. That was something the familiars did". Kazumi is as curious as we are. Kyubey's cameo in Chapter 4 is this. Cypher Language: The runes appear in Chapter 5. And then in Chapter 6 we actually see a witch speaking it. Chapter 9 adds some Foreshadowing: "We have no future as long as he's around", as Nico's copy turns into a witch. Dark and Troubled Past: Kazumi may have one; a Flash Back panel in the first chapter has her standing over a number of dead bodies. They're her clones. Chapter 10 reveals all the other Pleiades have one. See Despair Event Horizon and Psychic-Assisted Suicide. Deal with the Devil: As in canon, but in Chapter 9, Jubey notably says Nico's spare was compensation for her contract. Death Seeker: The Kazumi fight in Chapter 14 was two-fold: the current Kazumi did not intend to fight the clones, while the others wanted their deaths. Despair Event Horizon: Chapter 10 shows how each of the Pleaides - except Kazumi - went over the horizon before the story began. Driven to Suicide: In Kaoru's backstory, the person who injured her nearly killed herself for ending Kaoru's career. See also Psychic-Assisted Suicide. The Fair Folk: The contract-making creatures are described here as fairies. One of them, Jubey, appears at the end of Chapter 3, although he's not revealed to be one until Chapter 4. It's later revealed he's an Incubator that underwent Heel Face Brainwashing...maybe. Development Gag: An early series proposal for Madoka Magica also described the contract-making creatures as fairies. This may be a reference. Feminine Women Can Cook: Umika, Kazumi and the real Yuuri are really good cooks. Foreshadowing: It's pretty heavily foreshadowed that magical girls become witches...and the Pleiades know this. More character-specific, but when the Pleiades first arrive, Mirai is seen clinging to Saki, and also seems gleeful at the fact she's paired with Saki and Kazumi in their search. It's mostly ignored at the time, but guess who's shown to have a Violently Protective Girlfriend streak for Saki six chapters later? In Chapter 6 Kazumi turns Yuuri into some bizarre witch/human hybrid. This ultimately foreshadows Kazumi's own nature as witch meat stuffed into a human body. Waaay back in Chapter 4, Kyuubey appears and says "Do you think that things will go well this time, Pleiades?" He's referring to the fact that Kazumi is their thirteenth attempt at reviving Kazusa. Genre Shift: Much like it's parent series, it initially appears to be a straightforward magical girl series - with a heavier emphasis on comedy and Fan Service. This only lasts for three chapters. Human Popsicle: The Freezer, where the Pleiades keep the bodies of magical girls who have lost the connection to their Soul Gems. It also holds those Soul Gems. Idiosyncratic Episode Naming: Every chapter's title is taken from an unusually named food or something named after food that appears or is mentioned in it. Sometimes it actually plays a role in the plot. Word of God from volume one is that he'll change the food titles if he runs out of ideas. This may have happened in Chapter 7 (although the title is close to "cherry picking", and he goes back to using food in Chapter 8). Chapter 10's title is still a food pun in Japanese. See Lost in Translation. Chapter 12 is simply called "Pleiades". Chapter 13's title goes back to food puns - "Farce" is a synonym for "stuffing". And Chapter 14, "Cannibalism"...Well, it sort of counts. I Just Want to Be You: Airi wished to become Yuuri. A variation in that she didn't wish it out of envy, but rather to take revenge in Yuuri's name. "I Know You're in There Somewhere" Fight: Attempted by Kazumi on Airi after the latter's transformation into a witch. When it doesn't work, she tries to turn her back with magic. That doesn't go too well either. Kaoru tries this on (copy-)Nico's witch in Chapter 9...for about ten seconds. Important Haircut: Kazumi's long, flowing hair gets quite a trim from her friends in the second chapter. She decides it fits with the 'new Kazumi'. Incredibly Lame Stealth Pun: In Chapter 9, Mirai has a giant teddy bear hold down a witch by hugging it. It's a bear hug. In Name Only: Initially, it appears that the only connection this series has to the anime is that the monsters are called witches. It gets increasingly subverted in later chapters, until it's very clear that it's set in the same universe. I See London: In chapter 2, Kazumi forgets to form her skirt when she transforms, and her underwear is exposed. Let's Split Up, Gang! : Occurs in chapter 3 to search for missing teammates. Lighter and Softer: Compared to the original, Kazumi Magica comes off as far more lighthearted, with its heavier focus on comedy and Fan Service. Then comes Chapter 4, and the Cerebus Syndrome sets in. So far it can still be considered Lighter and Softer than its parent series, if only because the reader and the magical girls are already aware of the details and catches that were huge, horrible revelations to the original cast, and because The Power of Friendship is emphasized even more. It only remains to see what the death toll is to know if it really is so. Lost in Translation/Stealth Pun: A lot of them, most of them being puns on the Japanese language, characters, and pronunciation. See Meaningful Name and Mythology Gag for examples. The most notable example is the original Japanese title of Chapter 10. Kazumi's Magical Incantation in the original Japanese was "Chi-chin-purin", which is a portmanteau of "purin" meaning "pudding", and "Chi-Chin-Pui", a phrase equivalent to "Abracadabra" and other stock magical Incantations. The scanlators decided to translate it as Bibbidi-Bobbidi-Boo. Then the original Japanese phrase gets used in the title of Chapter 10. The scanlators simply translated the chapter title as "Bibbidi-Bobbidi-Boo", abandoning the Idiosyncratic Episode Naming. Mirai Wakaba's name, which means "Future Young Leaf", gives Kazumi the idea to the name her museum, "Ashitaba (Tomorrow's Leaf) Bears". The Ashitaba plant is also in the Angelica genus, and the museum's English name is Angelica Bears. Love Triangle: Mirai loves Saki, who loves Kazumi. Magitek: The Pleiades have a smart-phone application that can upload the magical wavelengths created by witches into Soul Gems, to make it easier to track them. Male Gaze: Much like its sister spinoff, the art tends towards things like low-angled shots of the girls, focusing on their legs and backsides. Marshmallow Hell: In Jubey's initial appearance, Satomi gives him a big hug. The problem is he's the size of a housecat and gets smothered. Meaningful Name: The Pleiades Saints, a seven-member magical girl team, named themselves after the Pleiades Star Cluster. It's a pun in Japanese; "Pleiades Saints" and "Pleiades Star Cluster" only differ by one character and are pronounced the same way. The Pleiades cluster is also known as the "Seven Sisters", which is why they chose they chose that name for their seven-member group. According to the author's Q&A from the collected edition, the subtitle "innocent malice" is meant to mean "sinless spite" in Japanese. It possibly refers to Yuuri's grudge against the Pleiades, but more likely refers to the fact that Kazumi is a magical girl clone stuffed with witch meat. Mythology Gag/Continuity Nod: Possibly. A black cat (later revealed to be named Toto) is seen in Kazumi's house at the beginning of Chapter 2, and later in Chapter 4. A similar black cat is seen in the Title Sequence of Madoka, as well as some official artwork. Interestingly, the writer of Kazumi Magica wrote the screenplay of the drama CD that explained who the Title Sequence cat was. Jubey looks like a black cat wearing a Kyubey mask. This may be a reference to the (Jossed) Epileptic Trees about the Title Sequence cat. Note that "Ju" is ten and "Kyu" is nine in Japanese. In Chapter 7 Ayase says she stopped at Asunaro before going to Mitakihara. While looking through binoculars like the ones Kyouko used, no less. Chapter 5 is thematically similar to Episodes 8, 9 and 10 of the anime. So are Chapters 8 and 9. A girl becomes a witch at the end of Chapter 8, who is then destroyed in Chapter 9 and a character nearly snaps the way Mami does. And Chapter 10 is the Origins Chapter, just like Episode 10 was. The Art Shift in Chapter 10 resembles the the anime's Deranged Animation. In Chapter 11, it's revealed that Kazumi was saved from a witch by Mami. No Ontological Inertia: Referred to in Chapter 7 when Kazumi realizes that Airi couldn't have erased her memories because they didn't come back when she died. Possibly averted with the Evil Nuts...unless it's a clue that Yuuri wasn't the one who created them. Parental Abandonment / Conveniently an Orphan: Umika and Kaoru mention that their parents are working overseas, and no mention is made of the other girls having guardians. Meaning no one to question why seven teenage girls are running around outside of school. Before the events of the story, Kazumi/Michiru lived with her grandmother when she wasn't studying abroad; no mention is made of her parents, either. People Jars: Where the Pleides keep the bodies of the Puella Magi whose Soul Gems they take. Print Bonus: The collected volumes contain a few extra pages and some silly comics. It also has design info for the various antagonists and an author's Q&A. Psychic-Assisted Suicide: Before they became magical girls, the Pleiades Saints were witch-kissed and made to jump off a building. They meet Kazumi when she rescues them. Origins Chapter: Chapter 5 is this for "Yuuri"/Airi. Chapter 10 gives us the origin of the Pleiades Saints. Chapters 11 and 12 are a continuation and also adds Kazumi's origin. Orwellian Retcon: The release of the first volume redrew some parts of the artwork, especially in Chapter 2. During serialization, the Soul Gems in that chapter initially looked like normal stones, but were redrawn as anime-style Soul Gems for the volume. In addition, the redrawn chapter reveals that Kazumi's earring-bell is her Soul Gem. Our Witches Are Different: The witches of this series at least at first are just humans who can transform into monsters (although they feed off despair). Defeating them turns them back to normal, and it's said that someone gives them this power. Chapter 4 reveals they are actually pseudo-witches created by imitation Grief Seeds, known as Evil Nuts. The standard witches from the anime do exist. Red Eyes, Take Warning: Played with; in chapter 14, Kazumi's (and the clones) eyes are shown as red colored. Kazumi's Magical Incantation is "Bibbidi-Bobbidi-Boo". This was something added in the scanlation. Kazumi's friends aren't the only magical girl team named after the Pleiades Cluster with an alien Team Pet. 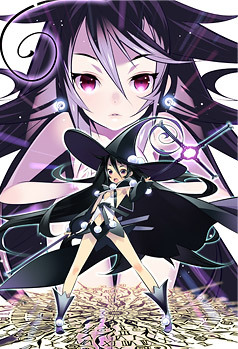 Bonus for Kazumi's Cute Witch hat, and the fact that Houkago no Pleiades is known as Wish Upon the Pleiades in English. It also appears as a cameo book title. (Not) Sinister Silhouettes: A panel in the first chapter contains four silhouettes. Three of them appear to be Kaoru in her magical girl form, as well as Nico and Saki. The fourth silhouette, the one with a witch's hat, may be Mirai - she was seen wearing a similar looking witch's hat as part of her magical girl outfit in a small panel from Chapter 12. Start of Darkness: Chapter 5 shows Yuuri's backstory. Story Arc: The first six chapters of Kazumi Magica can be thought of as one, connected through the primary antagonist. They can also be divided into two sub-arcs: The first three chapters are about Kazumi re-learning her role as a magical girl, and the next three are about a confrontation with the arc's Big Bad. The two sub-arcs also have dramatically different tones - the first three chapters are lighthearted and comedic, while the next three are just the opposite. The next three chapters deal with an antagonistic magical girl, and the three chapters after that are the Origins Arc. Stripperific: Kazumi, the mysterious magical girl "Yuuri"/Airi, and Mirai's Magical Girl costumes. Tender Tears: Kazumi and Satomi in chapter 4. Satomi and a younger Nico in chapter 10. Nearly all the magical girls in Chapter 6. Transformation Trinket: The Soul Gems. Two First Names: Like in the anime, the magical girls. In Chapter 10 Umika tells Kazumi that they lied to her about the origins of witches. What makes this disconcerting was that it was Jubey who told that lie to Kazumi. Unreliable Narrator: There are some hints that the Whole-Episode Flashback in Chapter 11 isn't entirely accurate. When Juubey first appears in the chapter, he seems to have Kyubey's silhouette. Then in the flashback in the flashback he is seen with Mami Tomoe. Chapter 12 is either this or Series Continuity Error - in Chapter 2 Kazumi is told Umika and Kaoru didn't know what her wish was...yet in the flashback Kazumi does tell them about her wish. Furthermore, Kaoru's wish in the flashback is entirely different from what she told Kazumi in Chapter 2. They could have been lying, but that just raises more questions. Given that Umika can modify memories, it's also possible the flashback is false. As revealed in Chapter 13, Kazumi, being a clone, has no memories of her own - they were all implanted by Umika, who admits that she's probably made mistakes. However, Kaoru specifically says that she initially lied to Kazumi. The Un-Reveal: In Chapter 8, Kazumi is set to learn the truth about the Pleiades Saints...and then Nico becomes a witch. Or does she? As of Chapter 17, we still don't know what Nico's wish was. Visual Pun: Chapter 9's BEAR HUG! Well-Intentioned Extremist: The Pleiades are turning magical girls into Human Popsicles so they don't become witches. They hope to find a way to clean their Soul Gems. What Measure Is a Non-Human? : The Pleiades are utterly relieved to find that only Nico's "spare" turned into a witch...but it's clear to the reader that she had thoughts and feelings of her own. This is Satomi's attitude towards the Kazumi clones. Since it looks like the newest Kazumi might be corrupted by an Evil Nut, she just decides to kill her and try again. In fact, all of the Pleiades have shades of this attitude - they just want Michiru back, and will keep cloning her (and the recently witchified Satomi) until they get it right. Saki's reservations only came from the fact that she loved Michiru and couldn't bring herself to kill the clones. Kaoru calls them out on this, but it doesn't work. Wham Chapter: As to be expected from the spin-off to the series that delivered a WHAM line every episode. Chapter 4: Kyubey appears at the beginning of the chapter. The other Weasel Mascot can purify Soul Gems. The witches from the first two chapters were really pseudo-witches created by imitation Grief Seeds. Yuuri reveals her name and becomes the Knight of Cerebus. And just to top it off, the chapter ends with Kazumi getting an imitation Grief Seed shoved in her forehead. Chapter 5: Kazumi learns the Awful Truth firsthand when Yuuri becomes a witch. It's confirmed that the other Pleaides Saints already knew that magical girls become witches. A flashback reveals that Yuuri wasn't really Yuuri at all, but a girl named Airi. The real Yuuri was Airi's friend who had turned into a witch and was killed by the Pleaides Saints. Airi had wished to become Yuuri and took her name and appearance in order to get revenge for Yuuri's death. And she was being manipulated by Kyubey the whole time. Chapter 8: Comparatively minor, but the Soujus pull out Evil Nuts, which either implies they avert No Ontological Inertia or were created by someone other than Yuuri. And then Nico becomes a witch. Chapter 9: Mirai kills witch!Nico with one hit. Then another Nico appears, and we find the other one was actually a copy, which she demonstrates by erasing the face of it's body. Then Kazumi is taken to Mirai's museum, and she learns that the Pleaides are turning magical girls into Human Popsicles. Chapter 10: Kauzmi is told the truth about Soul Gems and witches. It then turns into the Pleiades' Origins Chapter as they give Kazumi back her memories. Umika's first novel was plagiarized by her editor and released as another person's work. Kaoru received an injury that prevented her from playing sports and made the person who injured her try to kill herself out of shame. Satomi's childhood pet cat died and she blamed herself for not listening to it. Mirai was a Nerd Glasses-wearing student ostracized by everyone else and her only companions were teddy-bears. Nico, as a little girl, accidentally shot her friends while playing around with a gun. Saki was caught in a horrible car accident with her younger sisterd Miyuki, who died. Then they all get witch kissed and jump off a building...where they are saved by Kazumi. Chapter 12: Jubey is an Incubator with Fake Memories and Heel Face Brainwashing courtesy of Umika. Then, at the end of the chapter, Satomi says a Wham! Line with a Slasher Smile, suggesting something more sinister is going on. Chapter 13: The real Kazumi was a girl named Kazusa Michiru who turned into a witch and died before the events of the story; the current Kazumi is the thirteenth clone made from the remnants of the original's witch form. Kazumi's earlier exposure to the Evil Nut is causing her to revert to her witch form, and Satomi wants to kill her before it happens. Chapter 14: Kazumi was stabbed by Satomi while in combat. Chapter 15: Satomi becomes a witch while fighting Kazumi, and most of the other girls vote to kill Kazumi and revive her and Satomi as many times as is necessary. Chapter 17: The Kazumi at the Freezer turns out to be a clone created by Nico, who shows up carrying the real Kazumi. When Mirai questions her, Nico points out Saki's Soul Gem, which is about to break. Then another Nico clone shows up behind Saki and presses an Evil Nut into her forehead, while the real Nico remarks that it would be troublesome if "you humans" killed Kazumi. Wham! Line: Chapter 12. "Saki...let's kill Kazumi". Chapter 17: "It would be troublesome if you humans killed Kazumi." Said by Nico. Whole-Episode Flashback: Chapter 11, which ends with a flashback in the flashback. Chapter 12 continues Chapter 11's flashbacks, up until the end. Yin-Yang Bomb: Kazumi and Nico pull something like this off in Chapter 8. The Soujus also use a variation on the trope with fire and ice. You Are Not Alone: Said in Chapter 3. This page was last edited on 26 August 2014, at 19:10.